Exhibition history: Moncton, Sackville, Notre-Dame, NB. 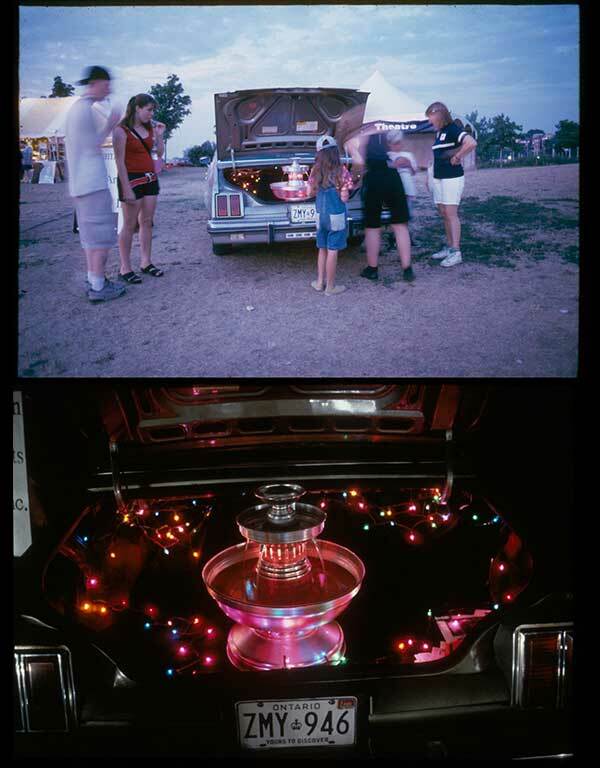 Top: Installation of the TRUNK© Gallery sign. October 1996. 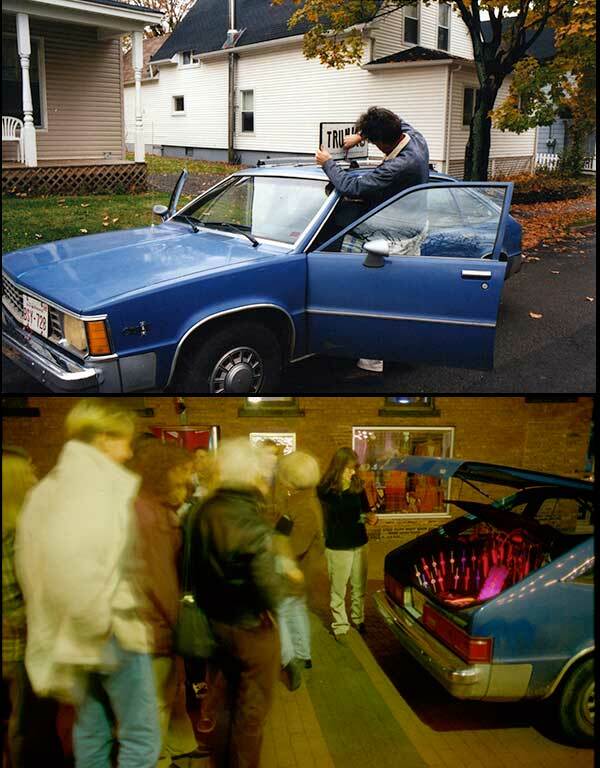 Bottom: Opening of the exhibition, The Time of the Day, Valerie LeBlanc on Robinson Street, Moncton. November 1996. Exhibition history: Parking lot of ACAD, Calgary, AB. Top: 24th Annual Edmonton International Fringe Theatre Festival, Edmonton, Alberta. August 20th, 2005. Bottom: 19th Festival International du Cinéma Francophone en Acadie, Moncton, Marché de Dieppe event, NB. 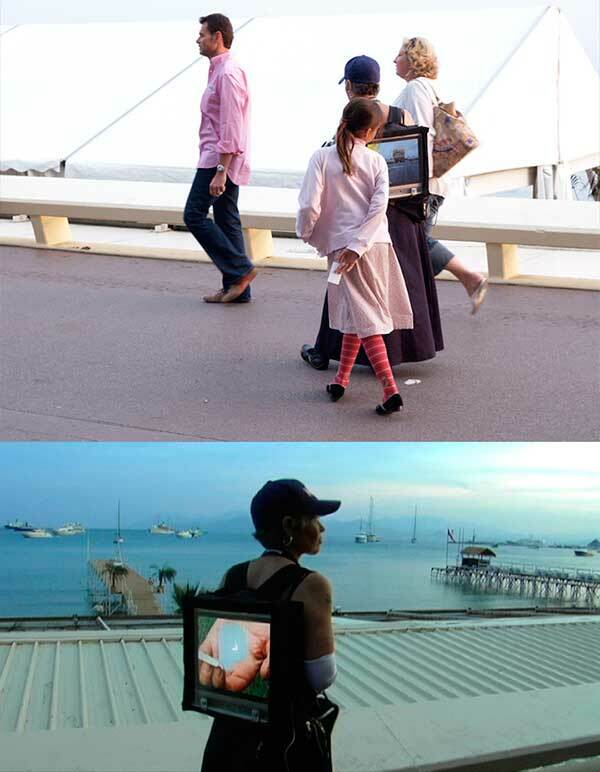 Volet arts médiatiques co-sponsored by the Galerie Sans Nom, September 2005. Projects funded by: Alberta Foundation for the Arts, Project Multidisciplinary Grant. Community based video drama, realized with an amateur cast from Vallauris. 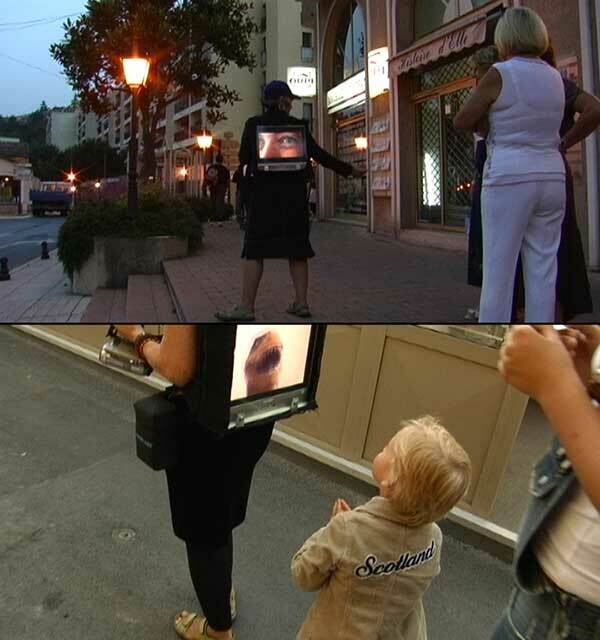 The project was directed by Valerie LeBlanc and screened on the MediaPackBoard in the streets of Vallauris, June 28 and in Paris, June 29. 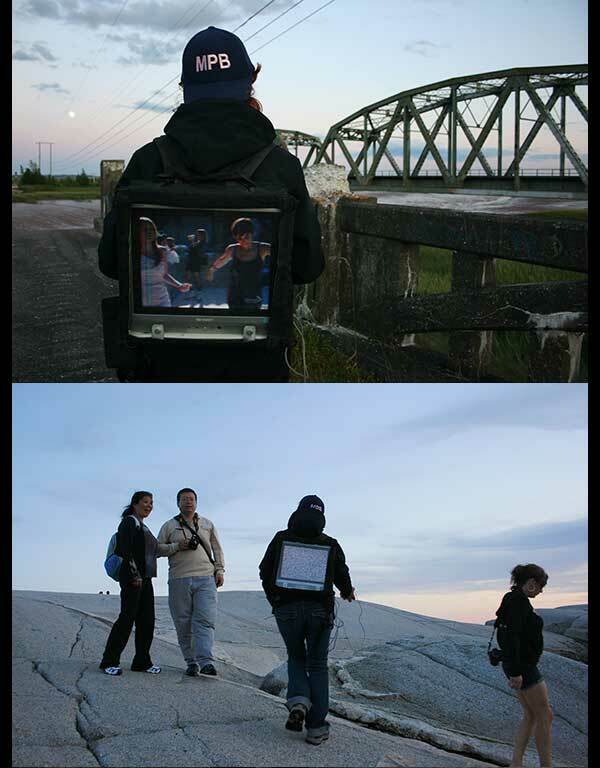 Project funded by: Alberta Foundation for the Arts, Project Multidisciplinary Grant; Alberta College of Art and Design, Faculty Research Award; Canada Council for the Arts Travel Grant. 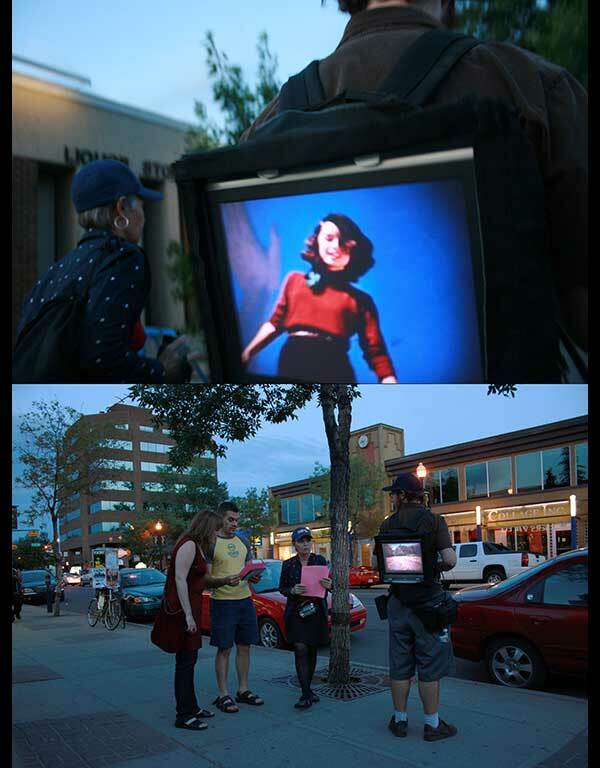 Exhibition history, itinerant screenings: Calgary, Drumheller, Edmonton, AB. 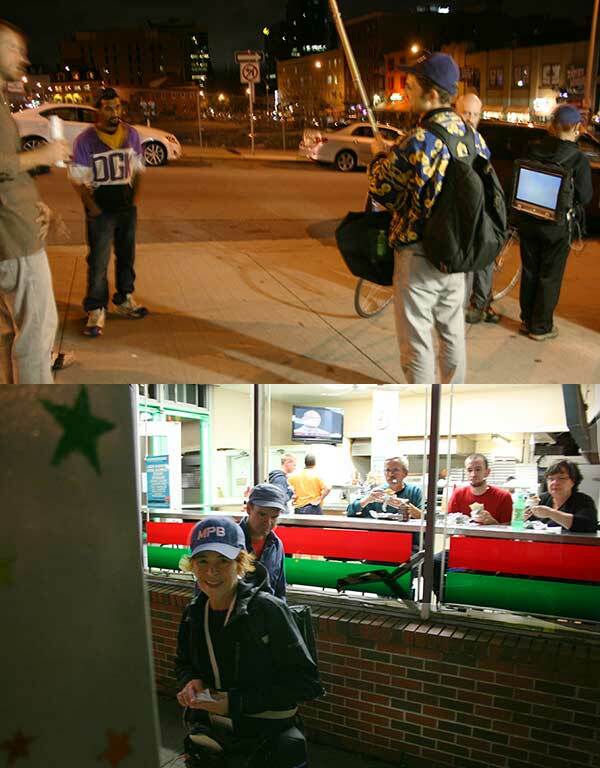 Top and bottom image: MPB in Edmonton, guest carrier: Eduardo Martinez. MediaPackBoard Curates 2007, the 3rd iteration of the MPB project took place in the summer. 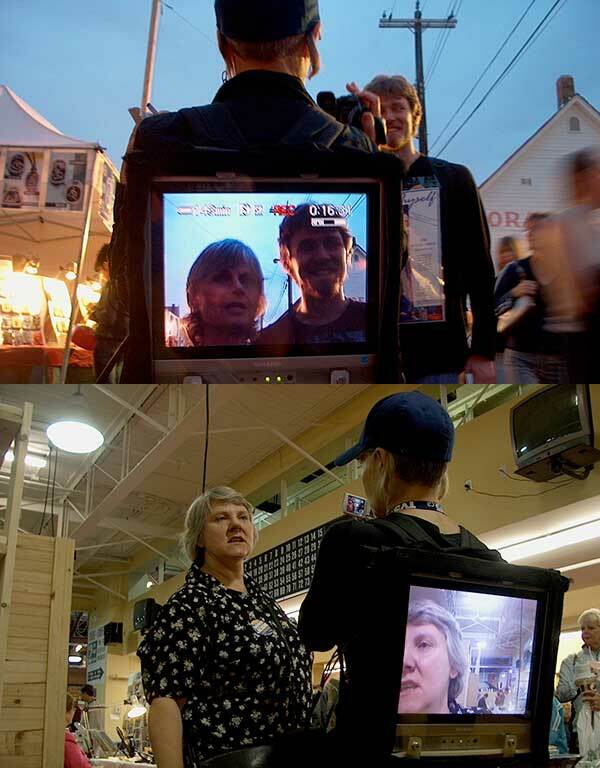 This time around, Guest Carriers offered the random public audience new personalities and presenter techniques. The program featured the videos of five Canadian artists: Amalie Atkins, Terry Billings, Linda Rae Dornan, Jim Goertz and Jeffrey John Jackson. Guest carriers: Mark Lowe, Duncan Kenworthy and Eduardo Martinez. Project funded by: Alberta Foundation for the Arts, Project Multidisciplinary Grant. Top and bottom image: MPB, 17th Ave. SW Calgary, guest carrier: Duncan Kenworthy. 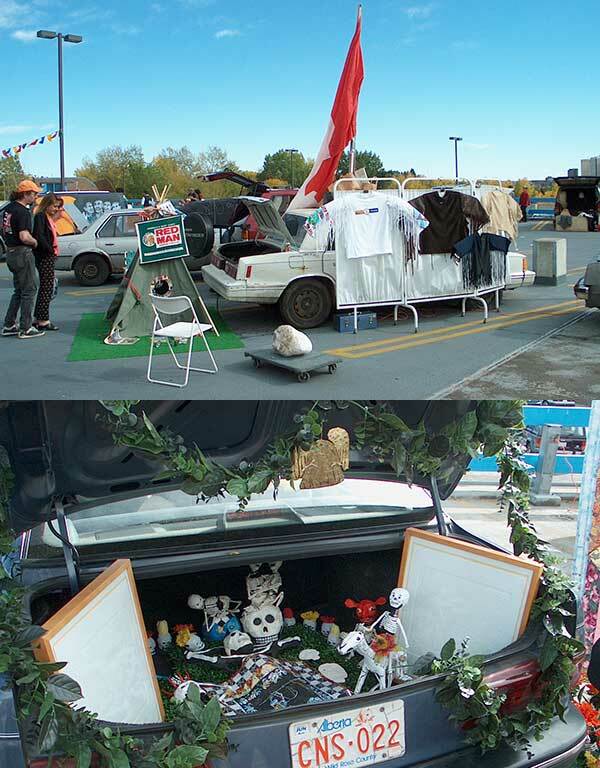 Exhibition history: Truck Gallery and Artcity – offsite event, downtown Calgary, AB. Image: VL with MPB Earth, Stephen Avenue Mall, Calgary, AB. MediaPackBoard’s fourth year of programming was launched on Saturday, September 13, 2008. 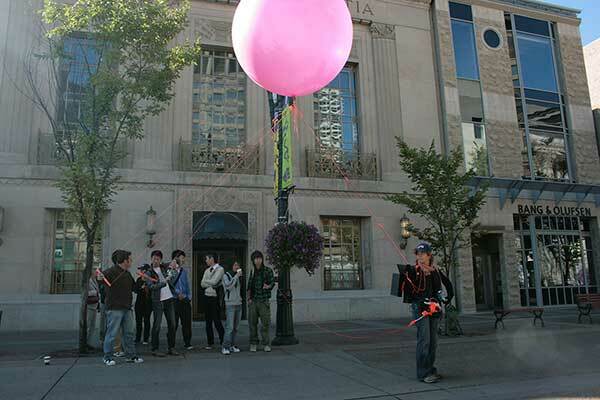 Presented through Calgary’s TRUCK Gallery and Artcity, MPB EARTH: The Angle of Incidence is Equal to the Angle of Reflection offered public audiences the chance to take part in a hands-on science experiment. A small camera mounted on the string of a weather balloon transmitted its point of view to the backpack monitor. 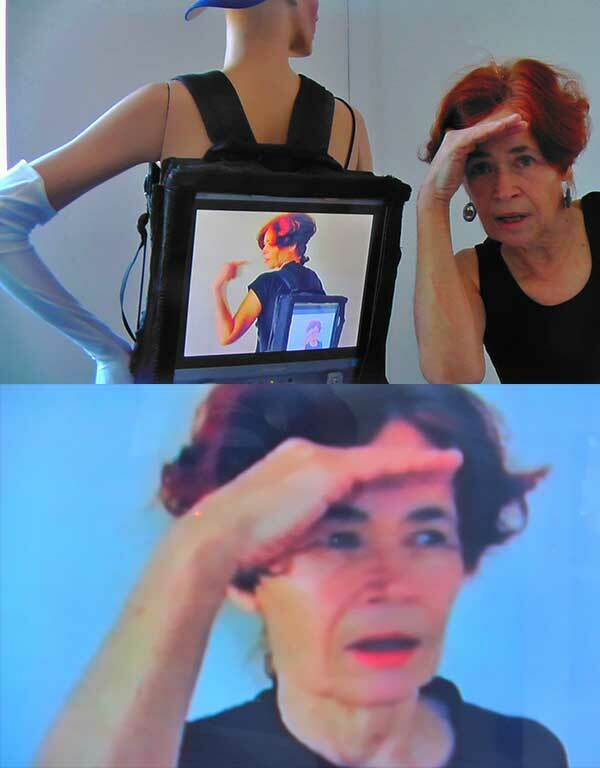 Through use of a mirror, Participants were able to direct the eye of the camera to pick up what they wanted it to see. 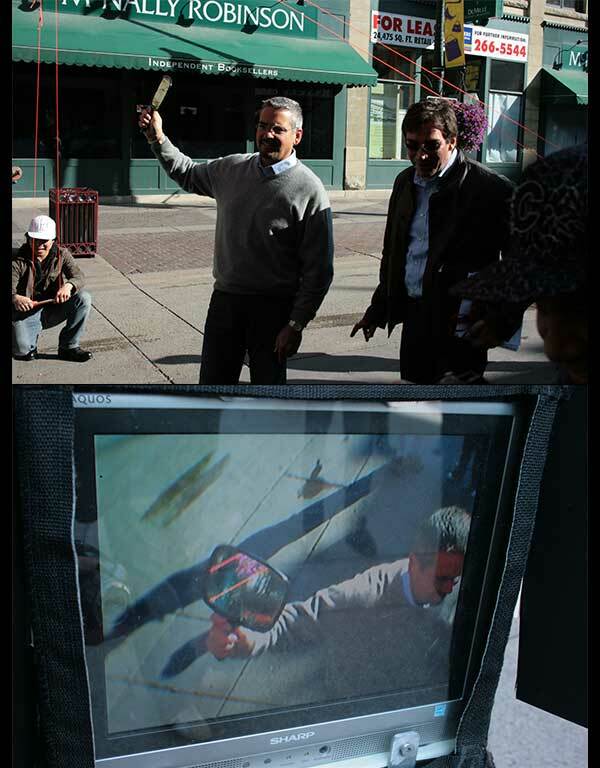 Assistants and Participants were able to ‘zoom’ the camera view by reigning connecting kite strings in or out. The CRTC imposed a mandatory digital transition deadline of August 31, 2011 in 28 markets. The exception: some CBC transmitters were given a temporary one-year extension. Industry Canada stopped issuing licenses within Canada for analog broadcast. MPB got out to investigate what would be lost. 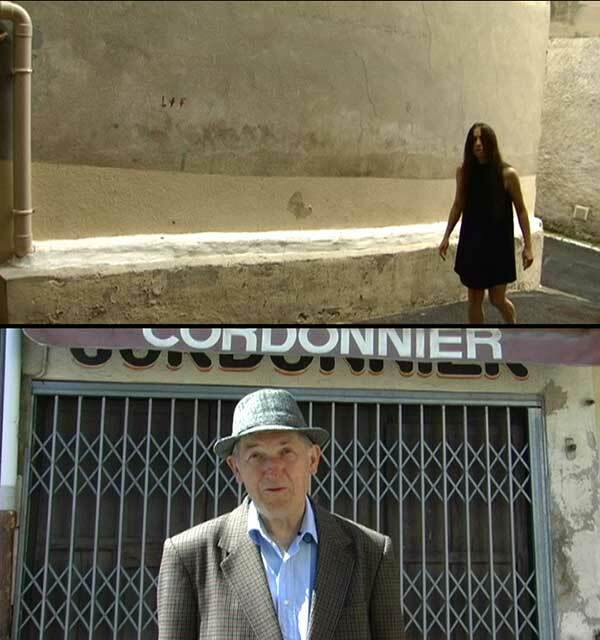 Top and bottom image: still from the video MPB Was There Then. One’s own sense of presence, of being here, of being here now, is the exact momentous hinge. Fleeting, racing, flying in reverse, encapsulated pearls of events are dissolved into the universal space as soon as they breathe life. They become strung on the flowing chain of events ordered through the construct of time. Surviving in the current climate is enhanced by virtual presence, and at the same time, the voyage through the day-to-day chain of time-based events can, at times, become tenuous. That is when it is important to remember that regardless of any worldly physical architecture, the moment of thought will always be located here and now. Exhibition history: WPGC 2012, EyeLevel Gallery, Halifax, NS. The World Portable Gallery Convention 2012 was an international convention of portable galleries and alternative spaces hosted by Eyelevel Gallery during the month of September. The project celebrated the variety of spaces with which curators around the globe have extended public interaction to spaces outside of the walls of art institutions.